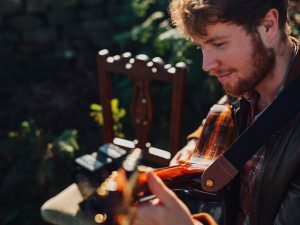 Still in his mid 20s, Jack Rutter (Moore Moss Rutter, Seth Lakeman band, Jackie Oates band) is a highly respected singer, guitarist and multi-instrumentalist playing within the British folk tradition. His new solo set features a range of well known and rare traditional songs from a variety of sources, delivered with guitar, bouzouki or duet concertina accompaniment that complement his signature ‘honest, unaffected vocals’ (Yorkshire Evening Post). Jack grew up in the Holme Valley area of West Yorkshire, a place steeped in a wealth of traditional song and since graduating from Newcastle University with a BSc degree in Countryside Management in 2014, he’s gone on to forge a hugely successful career playing music professionally in various guises across Britain and Europe. In this new solo outing, the BBC award winning musician presents the traditional songs and narratives that are so important; all delivered with an easy going stage presence and rich unassuming Yorkshire charm.